Happy Thursday everyone!! Here is a look at one of the outfits I wore earlier this week. Although this dress isn’t maternity, I am loving that it’s flowy and comfy, especially with how fast my little guy is growing!! You look gorgeous! The dress is so sweet and these shots are amazing! I love your dress! It’ so beautiful and feminine and romantic! This is such a gorgeous summertime look! I’m loving your maxi dress, it’s just perfect! You look great! 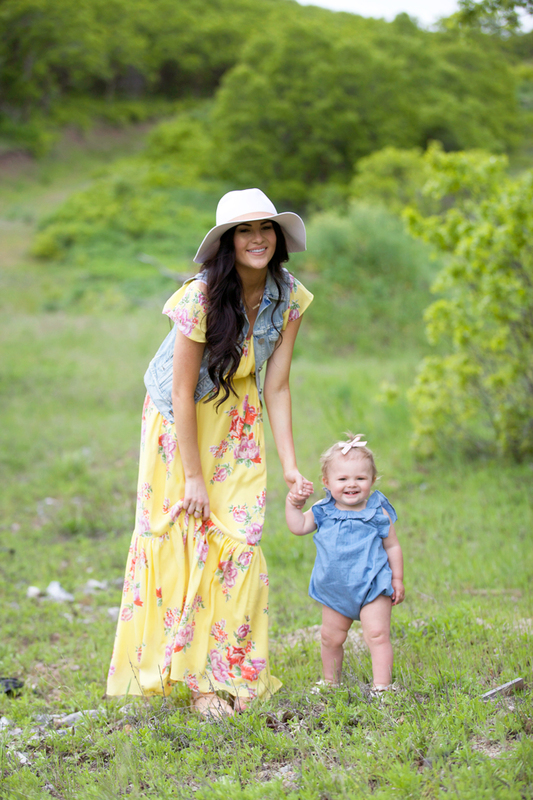 I always wore a lot of non-maternity clothes when pregnant too… so much easier to find a great selection! Francisca thank you so much!! For winter pregnancy layering is key when dressing your bump in the winter months! It allows you to be comfortable and stylish at the same time! That is a beautiful maxi dress! I love how it is flowy as well! Looks great on you! Rachel, congrats on the next baby to come. Really cute photos. I love when my dog, Pablo, makes an appearance on the blog. It’s so refreshing when he gets in, makes me more comfortable and the pictures are more fun that way. I’ve been wearing the Steve Madden lace-up sandals a lot these past few months and I always get compliments on them. Oh my gosh Maria the lace up sandals are my favorite and so perfect for spring and summer! Thanks for stopping by!! 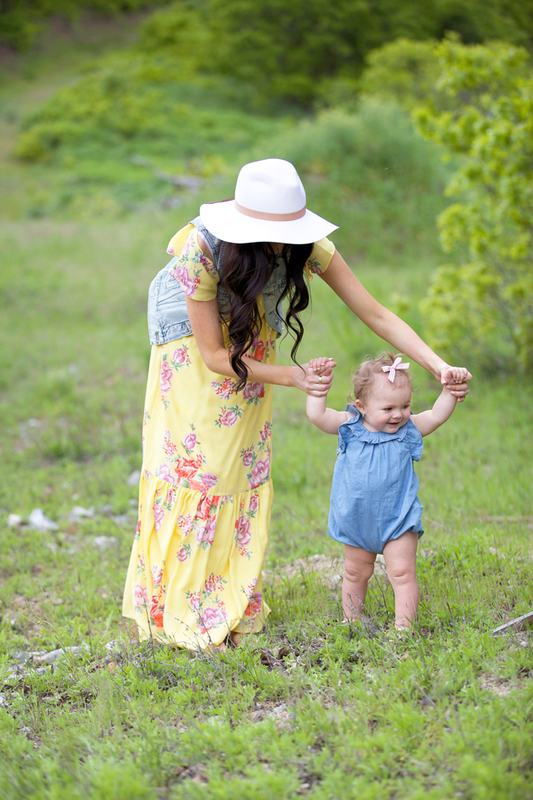 Ohh gosh, I adore that maxi dress… gorgeous color and print! I love the vest layer, too!! Great look, girly!! That yellow dress is simply stunning on you Rach. 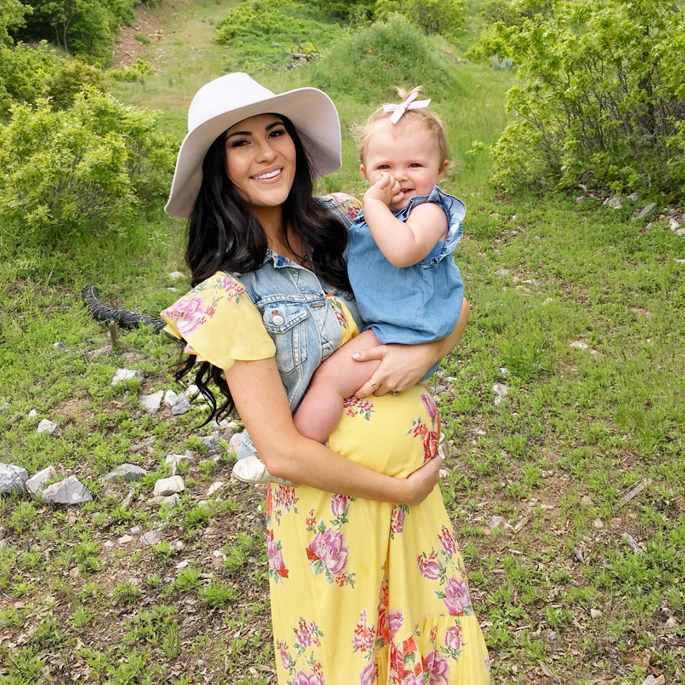 Gorgeous outfit and adorable pictures! Thanks so much Chelsea. I love your work and we both share a love for red lipstick!! Suzanne thank you so much. You would love it!! I love this dress! It looks so comfortable. :) Isla is such a doll! I can’t believe how big she is getting. I know Rachel I cant even handle it!! She is growing up so fast! You look beautiful but let’s be honest…..Isla stole the show! She’s an angel baby! It’s true Lidia she is a angel and we love her so much! Love the bright florals – perfect for summer! You look so precious with Isla and your bump! So sweet! And love that dress! So beautiful, I love the yellow dress! You should really be on Springpop, it’s my new favorite app. Omg!! 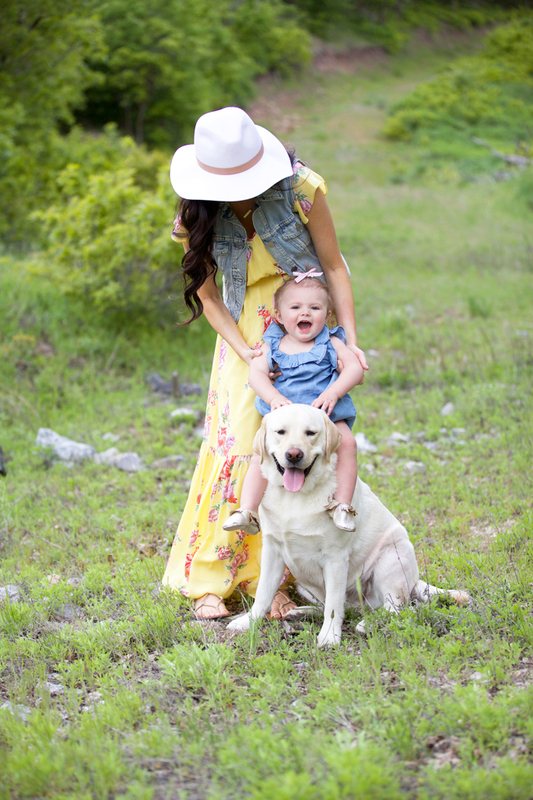 I can’t even with these photos…Isla and Dash are beyond adorable!!! Pure perfection ?? Love the gorgeous maxi!! Isla is so cute, she is getting so big! I love how happy you all look all the time! Isla is such a cutie. That dress is gorgeous, but totally out of my price range. I live vicariously through you, haha! Love that outfit! So beautiful!!! Such a sweet little family! Love that dress! 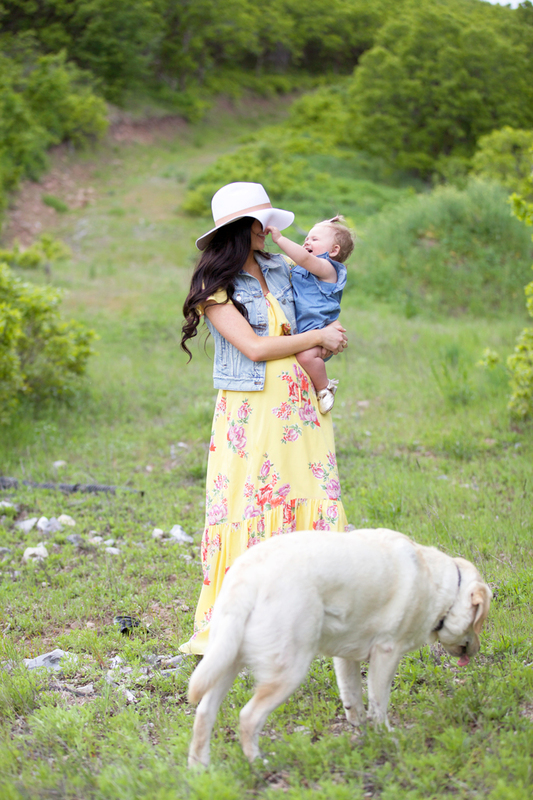 I love that your maxi, it’s so perfect for Spring and Summer. 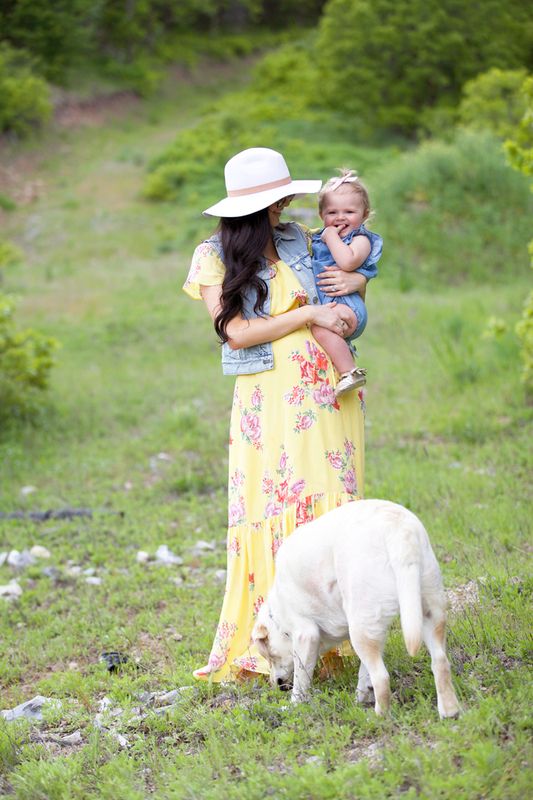 I can’t get over how cute Isla is grabbing your hat! Love this yellow dress! I love how you dressed it down with the denim vest. Very Chic! You two are gorgeous ! Such a pretty summer dress! You look beautiful Rach! Isla is so adorable!!! I love how you styled the dress with a denim vest! And that hat is so pretty! Love the colors. Hair is gorgeous as always!! What curling iron do you use? I adore this look! While the dress is out of my price range, I could totally do the top version. What would you suggest for bottoms to go with the top? Dark jeans? White jeans? I LOVE this yellow dress! Love this dress! It’s so pretty! Gorgeous photos! That dress looks so beautiful on you, I love the colours & the pattern! You really have such a glow! Yes ! 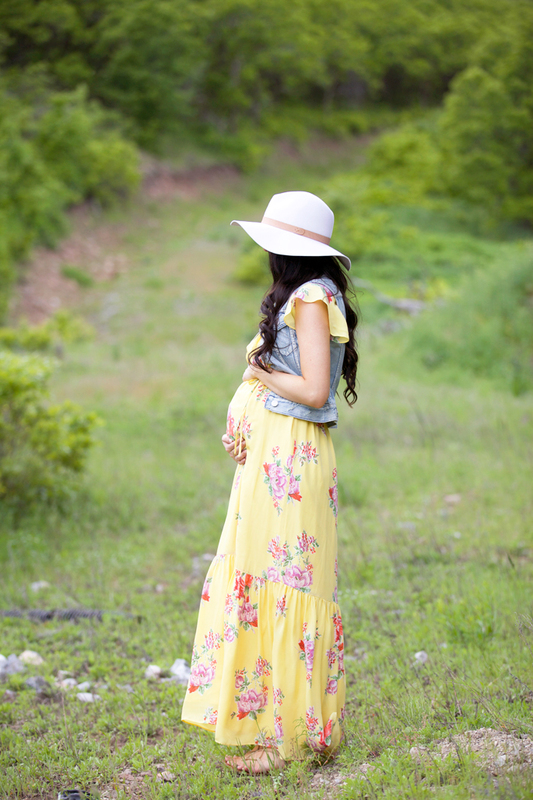 This dress is so perfect, it fits beautifully and will fit just as nice when you are not pregnant as well, such a great find <3 The colors are gorgeous also ! Beautiful dress, I’ve been loving yellow this summer, and this really caught my eye! I love the drop tier at the bottom. Hi Ann!! You are so sweet to say that! This little guy already brightens up my days and he isn’t even here yet!